"An Account Of The Ineffable Miracle Wrought By The Holy And August Icon Of Our All-holy Lady The Theotokos Of Cassiope For The Unjustly-blinded Stephen Who Wondrously Received Eyes Again. Which the Holy Church commemorates on May 8. Yet she beheld him not with those eyes wherewith he saw before. On the eighth of May God’s Mother gave eyes to the blind man. But Stephen, being a just man, as soon as he heard these things, endeavored to hinder them as much as he could with many admonishments, saying that this which they were plotting to do was a beastly thing, and that if they did it they would not escape just punishment as thieves and evil-doers. But they, like asps, stopping up their ears (Ps. 57:4), would not listen, rather they even attempted to convince Stephen to become an accomplice to the robbery. He, on his part, would in no wise consent to this. Whereupon, having first beaten the youths, they seized the flour and proceeded to their homes rejoicing. The youths, on their part, when they returned home empty-handed and weeping, related to their relatives what had happened. And they, searching diligently, ascertained who the thieves were and reported the deed to the ruler. Stephen was also accused together with the thieves, since the victims had seen him in their company, yet they did not know that he had tried to hinder them and that he had not aided them in any way. Those that were guilty of the theft, knowing their guilt, hid in order not to be apprehended and be punished as was meet. But Stephen, since he was innocent, went to the city without any fear. Hence, when he approached, he was recognized and arrested by the soldiers of the ruler and cast into prison. Afterwards, he was led bound before the governor for interrogation. On being questioned, he told the whole truth, that is, that he was walking together with the thieves, but that he took no part in the robbery and that he was unjustly accused. But in vain did he strive to convince the ruler. The words of the just Stephen appeared to the judge as false, for the judge thought him to be a thief and like the others. Judged guilty unjustly, therefore, by the governor, the innocent Stephen was called upon to choose which punishment he preferred, the privation of his eyes or the cutting off of his hands. And because the punishment of the privation of his eyes seemed lighter to Stephen, he chose this. Whereupon, leading him weeping and mourning to the customary place of punishment, they gouged out his eyes in the presence of many people. After he was blinded, his mother, weeping and lamenting, brought him to the church of St. Lazarus in order to seek alms. But most of the people in that place mocked and reproached him as one who had justly suffered punishment, that as a thief he forcefully took what did not belong to him. On the other hand, since they who took compassion on him were few indeed, he thought -- according to divine providence, of course -- to go with his mother to the church of the Theotokos which was in the village of Cassiope, by the sea, and which was at a distance of eighteen miles from the city of Corfu. In this church there is found the wonderworking icon of the Theotokos, and having an adequate quay outside the church, the boats would all moor there out of reverence for the all-holy Theotokos. It is at this place that Stephen thought to go and ask for alms from those who came to reverence the holy icon of the Theotokos. His mother also agreed to this. They went, therefore, to the church of the Mother of God, and after worshipping as was proper, with laments and sighs they recounted to the monk that was there the unjust misfortune which they had suffered and the reason why they betook themselves there. They also asked for a small cell in which to stay. He replied that until the brother who had the keys for the cells returned (for he was absent), they could stay in the church. Stephen’s mother, exhausted as she was from the journey, reclined and fell asleep immediately. But Stephen would not listen, and insisted that he actually saw the lamps, and even the holy icon of the Mother of God, and that what he was saying was not of his fancy. Then he related to her what had happened to him a little earlier, and that he had called out to her, but that she did not hear him because she had been sound asleep. His mother, therefore, perceived that this must be a divine manifestation. Whereupon, she arose immediately, and gazing carefully at the face of Stephen, she observed that truly he had eyes, and that whereas formerly he had had dark eyes, he now had blue eyes. Wherefore, from the great joy and awesome fear which overcame her she began to shout loudly and to weep, glorifying God and calling continually upon the name of the most-glorious Mother of God. 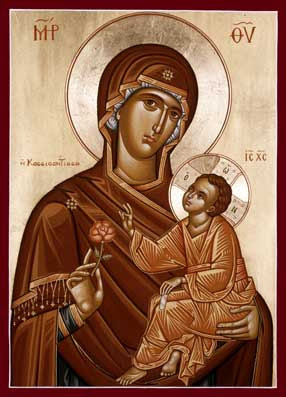 Both she and her son began to clap their hands and to magnify the all-holy Theotokos. Hearing the shouts and the clamor, and because it was before the appointed time of arising for the services, the monk who took care of the church became angry and began to reproach them as unruly and evil people, adding that they had been justly punished as such. But Stephen and his mother only continued shouting and relating the marvels of God. The monk, astonished and disbelieving because of the greatness of the miracle, came down into the church. He then beheld him who but a little before had been blind, now having eyes and seeing. Wherefore he departed immediately for the city. Finding the governor Balbi in the court house, he cried out against him, and accused him of being lawless. But those present attempted to expel the monk, saying to him, “It is not lawful to dare with such audacity to confront those which are in authority, and to be haughty and high-minded in such a manner.” He, on his part, shouted even more so, saying, “If Stephen had not been unjustly blinded by him, God would not have given him other eyes through the intercession of the Theotokos!” On hearing this, the governor sent certain notables, who, on their return, reported that the words of the monk were true. Then Balbi, accompanied by notables, went himself to the shrine, by means of the governor’s caravel, and all beheld with their own eyes this great miracle and, as was meet, they marvelled greatly. But the governor Balbi still entertained a doubt, thinking that it was not Stephen himself whom he saw, or that he had not truly been blinded, even as the Jews also had similar doubts concerning the blind man to whom our Lord Jesus Christ gave eyes. The greatness of the miracle did not permit the governor and certain others to accept it immediately. On returning to the city, therefore, Balbi called the executioner and said to him, “Did you take out Stephen’s eyes even as I had ordered?” The executioner verified then that indeed he had blinded him, and that the eyes which had been gouged out were still in the bucket, since it had been only the day before that he had done it. He went, therefore, and brought the eyes. When the governor saw them, he believed that the miracle was genuine, especially since he saw that the eyes were of a hue different from those which Stephen had received anew. It should also be noted that on Stephen’s face there were still evident the wounds of the iron implement by which his eyes had been gouged out. This, of course, happened by divine providence, so that the miracle might be proclaimed and be believed in as indisputable, that is, by the scars and the different color of the eyes. For if the eyes had been of the same hue, many might have said that they were the same eyes and that they had not been taken out. In this manner, therefore, the miracle was reported throughout all of Corfu and was believed by all. Then Balbi called Stephen and asked his forgiveness for the injustice which he had inflicted upon him out of ignorance. Rewarding him with goodly gifts and attending to him with much kindness, he sent him immediately to his home. Afterwards, the governor was very diligent to renovate the courtyard of the church and to embellish the shrine of the Mother of God at Cassiope. Many who at that time had doubts about the Orthodox Faith of our Lord Jesus Christ were made steadfast through this extraordinary and ineffable miracle. Beholding what had taken place and had been demonstrated in their own time, they came to believe in those things which are mentioned in the Divine Scriptures and which are usually believed in by hearing alone. As for those who remained in unbelief and would not honor this ineffable miracle, they were put to shame, for having eyes in order to see, even as the holy Prophet Ezekiel says, they saw not, and having ears to hear, they heard not. Let us all run, therefore, with faith and piety to the luminous Virgin and Theotokos Mary, and let us beseech her as one who has audience, that she may illumine the eyes of our understanding, lest we walk in the darkness of, unbelief and sin, and that she may intercede with God, Who was born of her, to rescue us from every temptation of the evil one and deem us worthy of the celestial kingdom of our Lord Jesus Christ, to Whom is due all glory, thanksgiving, honor, and worship, with His Father Who is without beginning, and the All-holy and good and life giving Spirit, now and ever, and unto the ages of ages. Amen."